First published between 1927 and 1958, the 26 classic books about Freddy the Pig have delighted five generations of children and are now going on to delight a sixth. They are available for the first time as Overlook paperbacks. 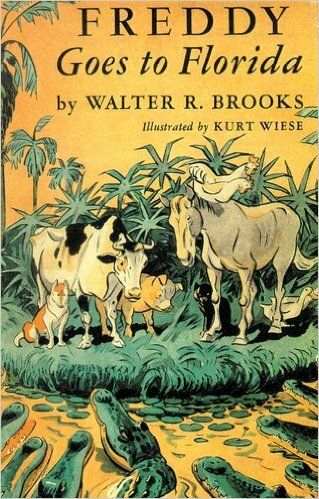 Walter R. Brooks introduced Freddy the Pig in Freddy Goes to Florida. Freddy and his friends from Bean Farm migrate south for the winter, with every mile of the way a terrific adventure complete with bumbling robbers and a nasty bunch of alligators. This is vintage Freddy and the whole ensemble cast at their charming best. I loved reading Freddy the Pig Series as a kid. They are funny and exciting tales of barnyard animals. Freddy Goes to Florida is the first story about Freddy and his friends who decide to spend the winter in Florida. This tale describes there adventures going, staying, and leaving Florida. Girls and Boys alike from ages eight to twelve will find the Freddy tales a thrilling adventure.